needless to say, when my blogger friend gentri organized a package pal swap, i was beyond excited! gentri partnered bloggers from different countries to swap packages with each other. in this way they can share a bit of their nation or city with their partner. normally i would argue that there is nothing better than getting a letter in the mail. except getting a package in the mail! that is by far the best! to me, creating a package is like creating artwork. its about carefully considering and personalizing every detail. since the goal here was to share myself and my canadian culture with my partner, i wanted each part of the package to represent that. i chose a number of relevant little gifts - most of which cost very little (you don't have to spend a lot to share happiness!). 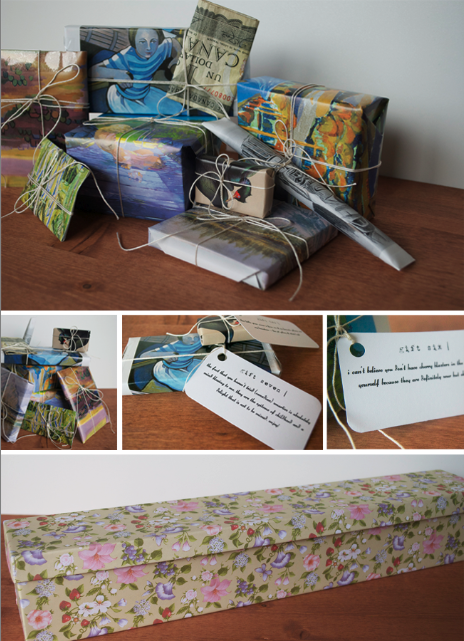 i ripped pages from an old calendar full of canadian art and used them to wrap the gifts. to add the finishing touch to each gift, i tied some string in a bow and also wrote little notes. i wanted to explain to my package pal why each gift was representative of where i lived. whether you make little tags or write a short letter, it's nice to include your own voice within the package. in order to spice up the package, i chose an elongated box as my mailing parcel of choice. it's different and my partner is unlikely to have received a package shaped like this before! i lined it with tissue paper in order to pretty it up inside. after slotting them in i added more tissue. as much as i adore the postal service and all the goodness it brings, it can be incredibly rough on your mail. so i made sure to pad the gifts in tightly. finally, i wrapped the entire box in brown kraft paper and stamped some images in black ink. if you have the time you can make your own stamps using potatoes or erasers! 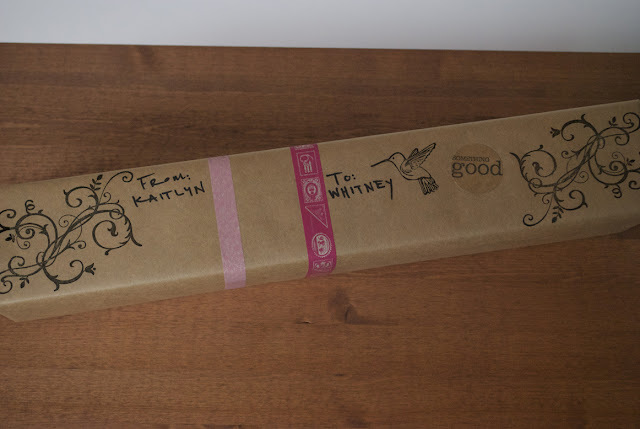 or simply use markers to add your own personal touch to the outside of the package. i can't stand blank packages - all that lovely space to impress your receiver shouldn't go wasted! i hope my pal enjoys this most excellent package and the rare little canadian one dollar bill! Holy Manoly! WOWOWOWOW! KAITLYN! You went ABOVE and BEYOND!!! WOW! Seriously, this is INCREDIBLE! OH MY GOODNESS! I have my Blog of the week post scheduled for tomorrow morning, and it has the link etc telling people to hop over here, but Tuesday I will do a post making sure this get's a big spotlight! And I'm emailing all package pal participants right now telling them to get their cyber butts over here! THANK YOU! Oh wow, what a great idea! And what a beautiful parcel! What a fantastic post. You have given me some great ideas for ways to present my parcels. 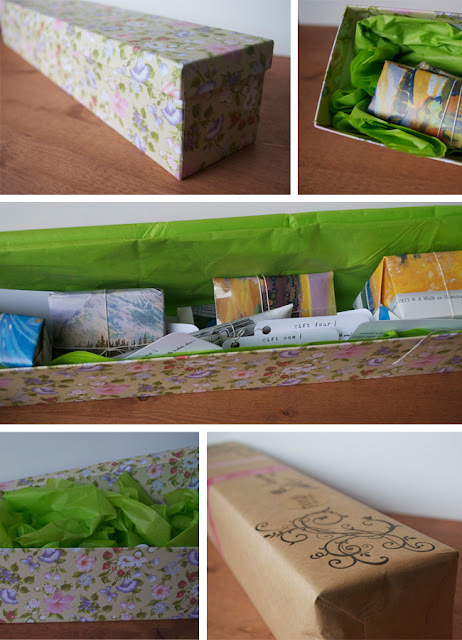 wow this is great, I think I might do this when sending my sister a little surprise package. Really like the floral design on the wrapping! This is such a wonderful package! I've been waiting all day (at work) to read this post, it was worth the wait. I hopped right over to your shop to pick out something for my (hopefully) packagepal. You really pulled together an impressive package! What a beautiful package. 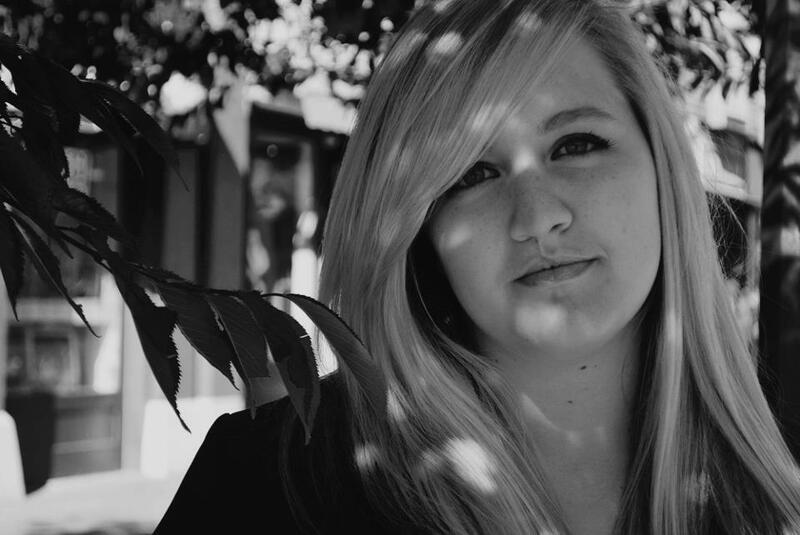 You inspire me to pay attention to the details. That is seriously THE cutest! I would melt if that were waiting for me on my doorstep! Very cute ! ^^ Thanks for so much inspiration. I really liked the idea of putting explanation cards to each little package, and the decoration of the paper. Nice final touch indeed!